Some sub-titles are given below corresponding to each of the paragraphs of the article that you have just read. Match the sub-titles with their paragraphs by writing the number of the paragraph in the space provided. Birth of the first modern drug. Man's hunt for medicinal plants from ancient times. 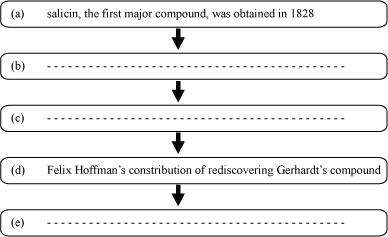 Complete the following flowchart that traces the contributory processes leading to the development of the first modern drug from the willow tree. Main Course Book (MCB) - English : CBSE NCERT Exercise Solutions & Summary for Class 10th for Unit-1 Nature's Medicines will be available online in PDF book form soon. The solutions are absolutely Free. Soon you will be able to download the solutions.